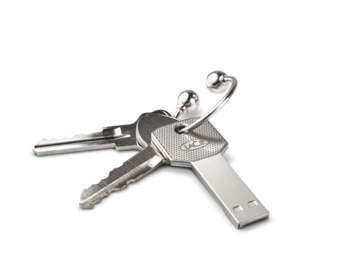 The iamaKey comes in 4GB and 8GB capacities and starts at $17.99. this is really a great idea – and it looks perfectly “right”. ooh! lovely. I want one!! wow !!! My birthday is on May 20th!!! Any of you want to buy it for me ??? One Lacie iamakey – check! I’d love one of these, really does just look right as matthew above said. Strangely enough I’m also quite attracted to the actual ring it’s attached to, very slick compared to the boring bog standard ones. I think I’d just like that whole set of keys. …and i just ordered mines. I will definitely be ordering one of these. Fantastic idea. I wish I had this keychain! It’s so minimalist, I love it! It may be from Tiffany’s. Very closely resembles their classic key ring. I love it – now where are my keys? I love it too. But why would one need a 4GB USB drive in times of cloud computing? With getdropbox or a .Mac account you can access your data everywhere, no need to carry it around. Aweomse. Got one of these from Play.com in the UK currently awaiting delivery. Hopefully not too long now, definitely the dopest USB key ever! Don’t need it but still… I WANT IT! So after seeing this a few days ago I ordered one and it arrived in the mail yesterday. Its excellent. It even has a little icon image attached, so when you open it with My Computer it shows up with a mini pic of itself. Anyways, I love it and have added it to my key ring!